Hand Sign Tutor: 9 perspectives! Hand Reading Experts in 54 Countries! This is a common condition - 20% of people have brittle nails. + vertical / horizontal splits. 2 - Medical problems (e.g. Raynaud, lung & skin problems). Treatment: vitamin B (Biotin 2500 uq), vitamin C.
7 - hyponychium; 8 - free edge. * NOTICE: The HandResearch Nail Tutor Tool is still in development. Currently this tool includes 57 nail disorders. The NAIL TUTOR tool is based on Medical Hand Analysis & Multi-Perspective Hand Reading, which e.g. implicates that one should keep in mind that any single nail abnormality should be expected to have an association with a range of potential causes! The purpose of this tool is to assist you with identifying the nature of a fingernail disorder. 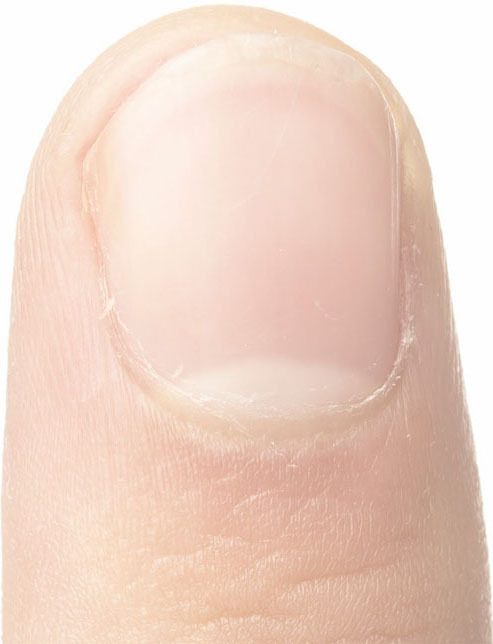 The section fingernail disorders presents a more comprehensive overview of the most common fingernail abnormalities. • Fingernails in the hand of children! • Fingernails in elderly patients! • Vertical nail ridges & your health! 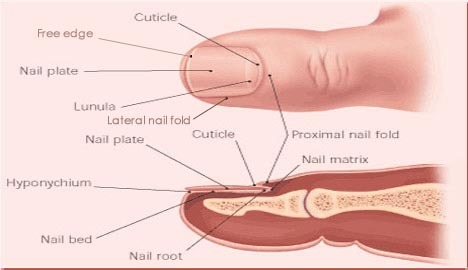 • What causes dry brittle nails? • Yellow nails + yellow nail syndrome! • Hand Sign Tutor: 60+ nail signs!